When the sun is out, and the weather is warm, outdoors is one of the best places to be. Branson has dozens of activities to enjoy in the great outdoors! With two great lakes within minutes of the Branson city limit, Table Rock Lake and Lake Taneycomo are a great way to cool off in the heat. You can visit Moonshine Beach or Dewey Short to soak up the sun while having a relaxing day at the lake. For kayaking, canoeing or stand-up paddleboarding, check out Kayak Branson, near Table Rock Lake, or located near Lake Taneycomo, White River Kayaking and Outdoors. Want something more exciting? You can rent a boat to go tubbing from Table Rock Lake Pontoons, Inc. or scuba diving gear from DiVentures to explore Table Rock Lake. If you want to spend time on the lake without having to rent a boat for the day, just enjoy a ride on Branson Jet Boats. Click here to see all the Branson marinas. Finding good golfing facilities can be difficult when traveling. Branson has many world-class golf courses for you to choose from, including Mountain Top Course, Branson Hills Golf Club, Don Gardner Golf Course, Holiday Hills Golf Resort and many more. 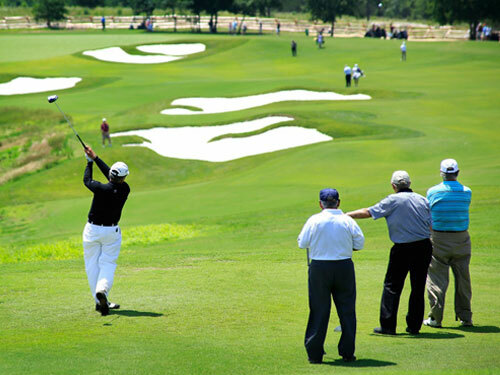 To see the full list of Branson golf courses, click here. You will experience the rolling hills of the Ozarks in a whole new way when you ride a mountain coaster. The Runaway Mountain Coaster, Branson’s first mountain coaster, uses gravity to pull you downhill and through two 360-degree loops over 5,000 feet of tracks. Race to the finish on North America’s first double mountain coaster, The Branson Coaster, where the tracks twist and turn so close you’d think you were going to collide! Hiking is a great way to get the whole family outside and moving. Table Rock State Park is not only a boat access to Table Rock Lake but also has many hiking trails to choose from. When you go to Dogwood Canyon Nature Park or Wolfe Mountain Photo Safari Guided Walking Tour, there are hiking trials along with several other activities available so that you can spend the whole day in the sun. You will feel like you are flying through the trees when you zipline in Branson. With many great places to choose from, such as Vigilante Extreme ZipRider at Shepherd of the Hills and Adventure Ziplines of Branson, it is not difficult to see way ziplining is a great way to spend the day outdoors. If you are looking for a lake view during your zipline tour, Parakeet Pete’s Waterfront Zipline is the perfect choice. Click here to check out more zipline adventures! 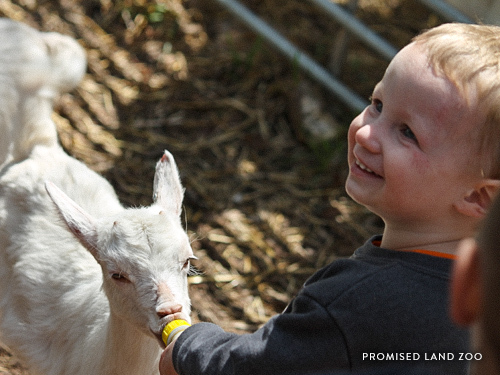 Branson’s Promised Land Zoo is the “#1 Animal Adventure” in Branson and a great opportunity to see animals from around the world up close. There are many ways to experience the 75-acres of natural Ozarks landscape, such as: Foot Safari, Parakeet Paradise, 2-Mile Drive Thru Safari, Guided Tram Tour, VIP Animal Encounters, Bottle Feeding and more! Interactions with animals fosters a love for wildlife while educating visitors of all ages. Harness your competitive side, when you visit The Track Family Fun Parks. With everything from go-carts, bumper cars, laser tag and more, this is one place the family can spend hours exploring. But if you are in search for a unique way to race one another, Snowflex Tubing Park at Wolfe Mountain is one place you will have to check out. This attraction is a 400-ft tubing slope that feels like tubing down a snowy hill, even in the middle of summer! Looking for something a little more challenging? Shepherd of the Hills Homestead Adventure Park has ATV rides and guided homestead tours that will get your blood flowing. For a full list of Branson attractions, click here. From adventures to leisure, Branson has outdoor activities for whatever you are looking for. Make sure you check out one of Branson’s live shows during your visit!